GSX Watch is a domestic Japanese brand founded in 1995. Which mission was and still is, to produce wanna have watches, instead of providing a lot of things cheaper. The company started in the form of bespoke watches ; nonetheless not all were full domestic . Two years later a major company milestone was accomplished when it launched in the summer of 1997 the series purely domestic, a “complete GSX design” . Actually the brand has an extensive models portfolio with a design of it own and an outstanding quality standards. 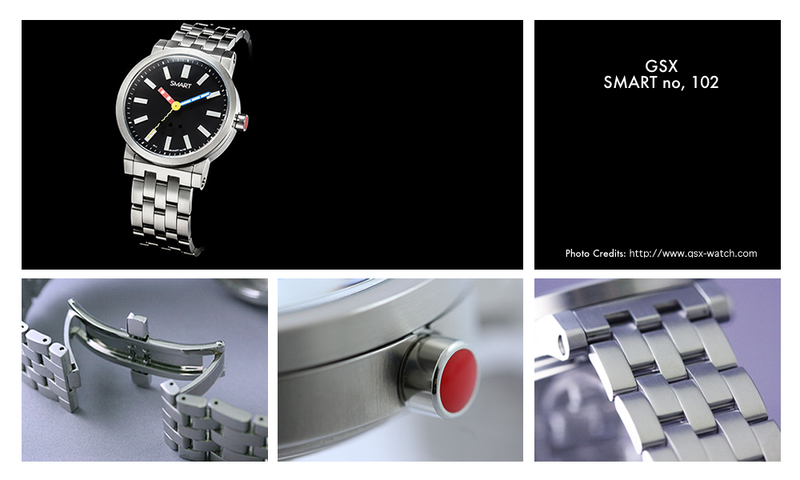 Recently it launched a new model within the GSX 221 collection line series, the SMART no 102 , that stands out by having three color coded hands over a black dial , in a very well finished 40mm diameter stainless steel case with 13,6 mm thickness. This model has a water pressure resistance of 10 bars, suitable for swimming or snorkeling, a fully every day use watch; it is robust, and you fell it on your wrist once it’s not a featherweight watch (150 g). There are also optional bands, made of leather or rubber that can be fitted, according with your taste.